Auriemma is about the only man in the world who can say this and not have it come off as condescending, but the UConn coach has a radical proposal he plans to present to the rules committee next spring—he'd like to see more scoring, fewer missed layups, and the way to do that is to lower the hoop for women's college basketball. "What makes fans not want to watch women's basketball is that some of the players can't shoot and they miss layups and that forces the game to slow down," he said. "How do help improve that? Lower the rim [from 10 feet]. Do you think the average fan knows that the net is lower in women's volleyball than men's volleyball? It's about seven inches shorter so the women have the chance for the same kind of success at the net [as the men]." 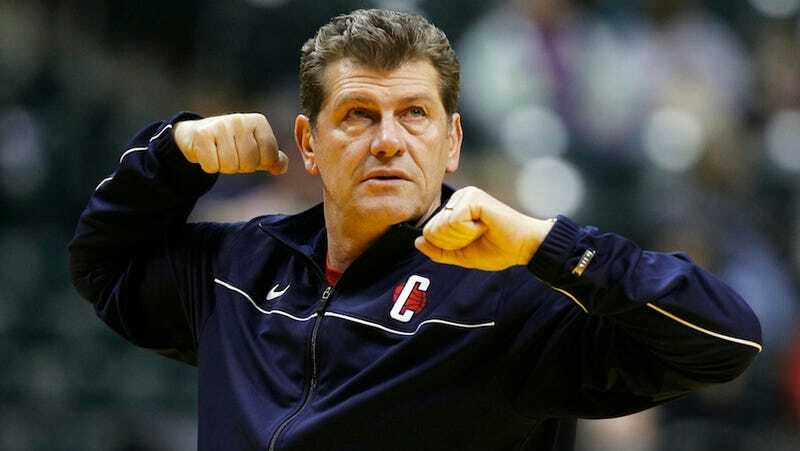 "Let's say the average men's player is 6-5 and the average woman is 5-11," Auriemma said. "Let's lower the rim seven inches; let's say 7.2 inches to honor Title IX [instituted in 1972]. If you lower it, the average fan likely wouldn't even notice it. "Now there would be fewer missed layups because the players are actually at the rim [when they shoot]. Shooting percentages go up. There would be more tip-ins." Also: more dunks. Leaving aside the fact that the lack of dunking probably isn't among the top 10 reasons people don't watch women's hoops, Auriemma's idea is an intriguing one. He's right, I had no idea that the net is lower in women's volleyball. The tee is closer in women's golf. The ball is smaller and the distance between the bases shorter in women's softball. In nearly every other competitive sport, the dimensions—and not the rules—are altered for the women's game. They alter the starting conditions, accounting for natural physical differences, to bring the end results in line. Hell, women's basketball already uses a smaller ball and closer three-point line, so why not tweak the basket itself? The game would speed up, become higher-scoring, and make the sport less ripe for jokes like these. So perhaps the concept isn't ludicrous. But the execution seems impossible, because the change would have to come at every level, not just college. Kids grow up playing on fixed 10-foot rims in schools, parks, and playgrounds. Adjustable hoops are expensive. Very few municipalities have the money or the motivation to install separate girls' courts with 9'5" baskets. The alternative to making changes from the ground up would be girls getting to college and overshooting rims suddenly shorter than what they've been playing on their whole lives. Which would mean more missed layups and less scoring, defeating the entire purpose of the rule change. And then, unless the WNBA adopts the new rules as well, it'd be another adjustment when they hit the pros. Auriemma's proposal is coming from the right place, it's just 100 years too late.